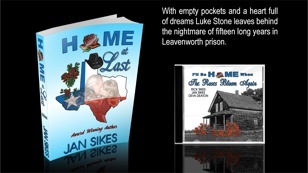 With empty pockets and a heart full of dreams Luke Stone leaves behind the nightmare of fifteen long years in Leavenworth prison, not giving it a backward glance. Eyes firmly on the future, he boards a Greyhound bus bound for Texas…for freedom…for the one who holds his heart. The unjust conviction no longer matters and revenge haunts him no more. Darlina Flowers, the woman who takes his breath away, waits ahead and with her by his side, nothing can stop him. He is headed HOME AT LAST. 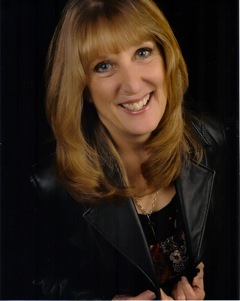 Award winning author, Jan Sikes, writes true stories in a creative and entertaining way. She also releases music CDs with each book. At a very early age, she developed a passion for reading. It not only provided entertainment, but also taught her about other ways of life and transported her to exotic places. Jan writes songs, poetry, short stories, screenplays and novels. I often get asked the question, “why is there a music CD with each of your books?” And I love it when I get the chance to give an answer. I’ll start at the beginning (although I promise to keep it short!) I grew up in a very strict religious household. We had no TV because it was against our religion. At a young age, I discovered the joy and adventures to be had through reading. My first love was Grimm’s Fairy Tales, but I soon progressed to reading everything I could get my hands on. I found such exciting people, places and happenings in the pages of the books. I could travel the world without ever leaving my bedroom. And then there was music! The church I was raised in had very lively music and that was always my favorite part of the service. My first piece of writing was a gospel song about my favorite uncle, who was an alcoholic. When I was a teenager, I received a transistor radio one year for my birthday. Then I discovered KOMA broadcasting out of Oklahoma City and XERF where Wolfman Jack did his show. Wow! I truly fell in love with music then. But I craved live music. So, when I left home, I sought it out. This is where the stories I write begin. I met and fell head-over-heels in love with a highly popular Texas musician. Little did I know what that chance meeting would grow to be. And that I would be singing and writing my own music along with him many years later. So, the short answer to the original question is: The reason I release a music CD along with each book is because these stories all revolve and evolve around music. Publishing music is much the same as publishing books. I see very distinct parallels. The production mode is different but marketing is similar. I have worked over the past three years to incorporate authors into music events and now that hard work is beginning to pay off. I am helping organize an event in Frisco, Texas this coming September called Wood and Words. It is a combination of songwriters and authors. I am super excited about it and hoping that it grows and flourishes. I hope the idea catches on everywhere because as I said, there are such parallels between music and books as far as creating and marketing. I hope that you will check out my true stories told through fictitious characters. Flowers and Stone is set in the rowdy raucous honky-tonks of Texas in 1970. Darlina Flowers is a young naïve girl while Luke Stone is older and a well-seasoned rogue musician. Their love sparks then ignites into an ever-burning flame. The Convict and the Rose is set in Leavenworth Federal Prison with Luke and Darlina being split apart by fate and circumstance. Both experience tremendous growth through the years and it is a story that can inspire hope for anyone in a desperate situation. Home At Last is set in the small west Texas town of Coleman. With empty pockets and a heart full of dreams, Luke Stone boards a Greyhound bus bound for Texas, for freedom and the woman who takes his breath away. Prison behind him and eyes set firmly on the future, revenge for the false conviction and imprisonment haunts him no more. He is headed home at last! ‘Til Death Do Us Part is slated for release in late summer of this year. It concludes this series of stories. Luke Stone found making music again, with Darlina at his side, more satisfying and rewarding than filling the Texas honky-tonks as he’d done in his younger days. But, there is only so much sand in the hourglass. Determined to make the most of what life dealt him, Luke persevered through trials that would destroy a lesser man. The music CDs that accompany these books are each unique, influenced by the time periods the music was written and performed. 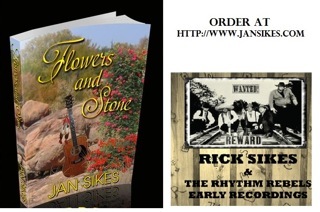 The CD that compliments Flowers and Stone is titled Rick Sikes and the Rhythm Rebels – Early recordings and is a compilation of songs taken from 45 rpm records that were made in the 60s. Forty Foot High, the CD that goes with The Convict and the Rose contains songs that were all written and recorded inside the walls of Leavenworth prison. It is historic. The most recent CD release – I’ll Be Home When The Roses Bloom Again – is unique in that it consists of songs written and recorded by myself and some written by both myself and Rick Sikes. The other unique feature of this CD is that our daughter, Deva is showcased with her silk voice singing songs that Rick and I wrote together. 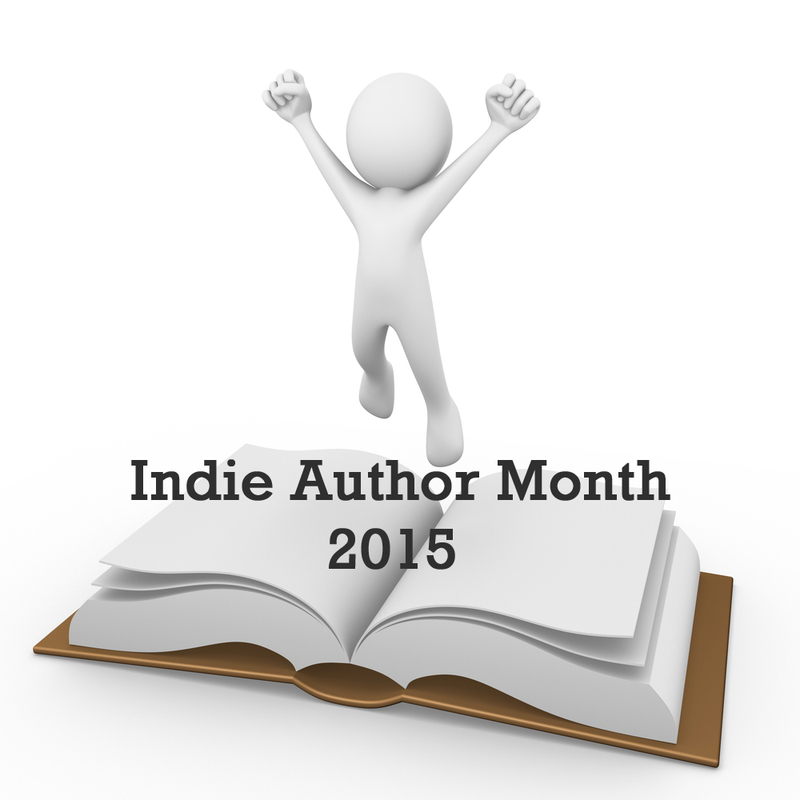 Thanks for taking part in Indie Month, Jan! 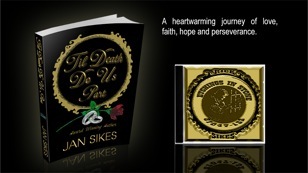 This entry was posted in Author Interviews, Events, Guest Posts, Interviews, July 2015 - Indie Author Month and tagged guest post, home at last, IAM2015, Jan sikes, writing and music. Bookmark the permalink. Jan, I love that you include a CD with each book. When I recently read Greg Iles’s book Natchez Burning I looked up every song on YouTube, and it enriched my experience of the book. Incorporating authors into music events is such a unique and exciting idea! I love the idea of pairing your writing with your music and involving both your husband and your daughter in the endeavors! Can’t say I’m a fan of glamorizing/romanticizing Texas or prison/prisoners/criminals, but I know those are popular and I wish you well.